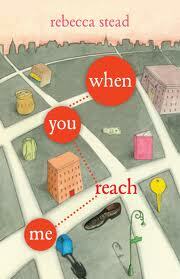 When You Reach Me was one of THE top recommended pieces of middle grade fiction that I saw being recommended . . . back in 2009 and 2010. Obviously, I'm a little slow on the draw here but at least I got to it, right? Better late than never? 1. It is a "coming of age" story. I think. Usually I avoid reading other people's reviews of books before I've written my own because I wish to avoid repeating someone else's thoughts. However, in the case of this book I can't make up my mind quite what to think of it so I stopped after copying and pasting Amazon's description and decided to re-read a few reviews in order to help collect my thoughts. * I started out reading Amy's review. (I find my comment on that post funny in light of my introduction to this book.) It appears that Amy couldn't quite put her finger on what makes this book so appealing to others. It is quirky. It is surprising. There is a great mystery throughout the book and it is wrapped up too quickly in the end without allowing the reader to really think through the facts and information. You connect dots only in retrospect. * Ronnica at Ignorant Historian noted this book as a top favorite in 2010 and I generally like the books she likes. Not real descriptive in her post there, but she did mention that it was fabulous a few times. Whenever I have debated over whether or not I think I would like this book, I remind myself that Ronnica mentioned several times that she liked it. A lot. * Jennifer read it with her daughter, Amanda, and shared her thoughts at 5 Minutes for Books. As she points out in her review, you kind of don't really want to know what the book is about because the book is a ride. The sort you just sort of get on and find out what it's about as you go along. And hope you don't get sick in the middle of. * Lastly, I knew that Sherry at Semicolon had highly recommended it, stating that it's worth your time and not to worry if you don't know where the book is heading, exactly, during the reading of it. You'll eventually find out. At the very end. And really, the ladies and reviews I've listed above have summed it up already and there is not much I can add to what has been said. It is s mystery. Of sorts. It's also science fiction. It is set in the 1970's. And mostly, it is interesting and very unique. I think. I guess I can't say so for certain, not having read many books of this genre, exactly. Despite the fact that I have no words of my own to tell you my exact opinion of it, you should know that I did rather enjoy the story, twelve-year-old kissers aside. (I will never understand teenage romances. Never.) This is not a book that I would go around enthusiastically recommending. Frankly, I think you'll do just fine in life if you never happen to pick up a copy of this book. But if you do, I don't think you'd be too sorry for the time spent with these characters. The ending is enough to make you pause and wonder over what just happened. I can relate to your distaste for juvenile romance. I'll never understand that either! Ick. This isn't the kind of book I usually read, but I thought it was interesting and entertaining. That is one unusual review. :) I liked it, even if you don't have me ready to read the book...at least I know it's out there and others liked it. I adore A Wrinkle in Time. Obscure literary references, a story that depends on the physics fo time and a nerdy, plain female heroine. It just doesn't get any better than that. I've never heard of this book.. but now I totally want to read it! 4. A WRINKLE IN TIME!?! WHAT?! I'm SO reading this!